One of the few Japanese jazz musicians who have truly "made it" in the US, Kengo Nakamura is now one of the busiest jazz bassists in New York. After studying at Berklee College of Music in Boston, he has played and recorded with Wynton Marsalis (Live at the House of Tribes), the Lincoln Center Jazz Orchestra, Roy Hargrove, Antonio Hart, Anthony Wonsey, Golson, Mal Waldron and Cyrus Chestnut, to name a few. 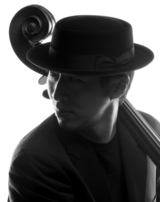 Talented musician with a big tone and strong sense of swing, Nakamura is also a very talented composer. His debut album Divine was released from Verve in February 2001, and his sophomore release Say Hello to Say Goodbye followed in 2002. Since then, Nakamura has released two strong leader albums, Roots and Re: Standards from the Japanese independent label 55 Records.